Hong Kong's CHP today is reporting their notification of the first H7N9 case since September 15th, and the first of what is expected to be the 6th winter epidemic since the virus emerged in the spring of 2013. During China's 5th wave a record 766 cases were reported. This first case comes from the prefecture-level city of Kunming, in Yunnan Province, roughly 150 miles from the Vietnamese border. A bit surprising since temperatures there during the month of November were often above average (see chart below). 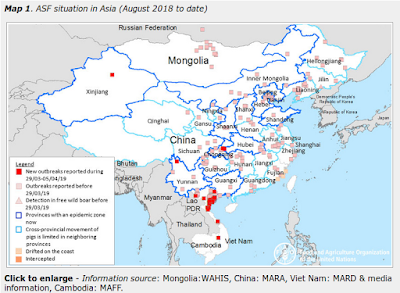 As we saw from a study last week, Cold-Dry Days Favor H7N9 Transmission, but at the same time we've been seeing H7N9 case reports continue well into the summer during the past couple of waves, sparking concerns the virus might be becoming more `heat tolerant'. First, we've the official announcement from the Yunnan Province Ministry of Health and Family Planning, followed by the Hong Kong announcement. Yunnan Health and Family Planning Commission notified: November 30, confirmed one case of H7N9 cases. The patient, male, 64 years old, now living in Kunming Xundian county, more than 10 chickens at home, before the onset of home raised chickens have died phenomenon, live chickens, chicken manure and dead chickens history of exposure. Currently, patients in the hospital for isolation and treatment. All in close contact with the patient are not abnormal, found no human to human. After the outbreak, Health and Family Planning Commission and the Government of Yunnan Province, Kunming provinces and timely mobilization of experts to treat the patient, to carry out epidemic disposal. Experts suggest that the public in their daily lives should avoid contact with sick or dead poultry, try to avoid direct contact with live birds; if found sick or dead poultry should be reported immediately to the local agricultural department or call the health hotline 12320 (0871-12320); flow from rural areas of the public not to live poultry vendors to purchase live poultry without quarantine certificates and bred; there is history of exposure to poultry and fever and respiratory symptoms should wear a mask, as soon as possible to local medical institutions for treatment, and the initiative to inform poultry exposure history to the doctor.